Matthew 6:19-20: Do not store up for yourselves treasures on earth, where moth and rust destroy, and where thieves break in and steal. 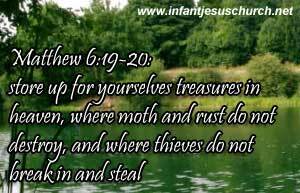 But store up for yourselves treasures in heaven, where moth and rust do not destroy, and where thieves do not break in and steal. Can we hide our heart? What we most value is where we will find our heart. Always it is an important question. We can see, and make treasure riches, control, security, and relationships. But Jesus teaches us that it is only by turning loose of the things that we keep as our treasures that we find what is truly treasure indeed. Today’s verse remind us this heavenly treasure. Heavenly Father, we pray that out of the richness of your love, you help us to find our treasure in you and nothing else. Today, we want to offer you all that we are and what we have, so that our life will be lived for your glory. In the name of Infant Jesus, our example and treasure we pray. Amen. Let us pray for the Thomas and Sunitha family for their special prayer request.